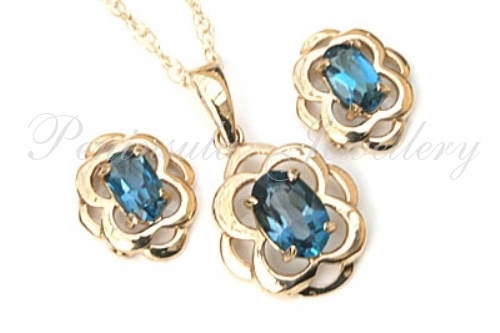 Pendant; Pretty Pendant with one 6x4mm oval London Blue Topaz gemstone set into an ornate 9ct Gold Celtic design. Dimensions 17mm drop including bail, 10mm wide at the widest point. Comes complete with 18" 9ct gold fine Prince of Wales chain. Earrings: Pretty London Blue Topaz stud earrings, each featuring one 5x3mm London Blue Topaz gemstone, claw set into a polished celtic design in 9ct gold with standard 9ct gold posts and scroll backs. Total dimensions: 10mm x 8mm. Made in England. Supplied in a luxury gift box.